She’s starred in some of my all-time favourite movies, and not only acts, but writes and sings and is super nice to boot. Recently I got to chat to the one and only Molly Ringwald about all the cool stuff she’s done later in her career. First published in QWeekend magazine, The Courier-Mail. 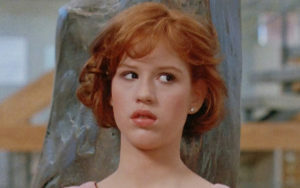 Molly Ringwald is a Renaissance woman. Not only does she have a couple of major television roles on the go, she’s written a novel, a self-help book, an advice column for a major newspaper and recorded an album. She might be known for seminal teen flicks such as Sixteen Candles Pretty in Pink The Breakfast Club, and, but at 48, her career is flourishing. “I won’t say I was a late bloomer, but I think there are certain people who are in for the long run and I’m somebody who was always in it for the long run,” she says on the phone from her home in New York, surrounded by the delightful evening chaos of getting three children ready for dinner. Her husband, writer and editor Panio Gianopoulos, is cooking. Ringwald is known for her coming-of-age movies, but turning 40 is also a coming of age. Significantly, she achieved many of these things after the age of 40. However, reaching the milestone was no picnic. “It was definitely traumatic,” she laughs. “Particularly for a woman who’s made a career in Hollywood. Hollywood isn’t exactly known for its best practices in terms of ageism. In other terms, I found it very freeing, because there is something confining about the incredible success of those (teen) movies, at least in America. They’d run all the time on television and I’m so well known for them … there was something about turning 40 that was just like, there’s no denying I’m a grown-up. One of those achievements was a book of sisterly advice for grown-ups called Getting the Pretty Back: Friendship, Family and Finding the Perfect Lipstick, which she wrote because she felt there was “a real dearth of books that were celebrating being a woman rather than a girl”. She also published a novel, When It Happens to You, a slice of many lives. Her acting career is flourishing, too, and after a successful run (2008-2013) playing a mum on TV drama series The Secret Life of the American Teenager, she is now starring in Canadian family sitcom Raising Expectations, in which she plays a child psychologist and mother of five Paige Wayney, whose husband Wayne is played by fellow former young star Jason Priestly. Ringwald also has another fun role as a self-help author in the second season of US comedy series Odd Mom Out. However, of all her passions, it’s music that has stayed with her the longest and it is what will bring her to Australia for a series of intimate cabaret concerts. Ringwald will perform her take on jazz standards — songs she has known since childhood. While “Molly the chanteuse’’ might seem like a new role, it’s actually something she has been doing since she was young. She recorded her first album, I Wanna Be Loved by You: Molly Sings, at six. She released its follow-up, her grown-up debut, Except Sometimes, in 2013. While she may be associated with the soundtracks of her famous films, jazz has been the soundtrack of her life. Her inspiration was her father, blind jazz pianist Bob Ringwald. The pair are very close. He is clearly a funny guy. His bio reads he was born in a small community in California, but “rumours of his virgin birth, being abandoned by wolves and being raised by parents … are grossly exaggerated”. His blindness was something she never really thought about. It was more a personality trait than a disability, she says, though it probably did influence her in other ways. Another person she pays tribute to in her shows is the late John Hughes — the talented director who changed the landscape of teenage films with his sensitive and funny movies that have been the favourites of generations. Hughes died after a heart attack at the age of 59 in 2009. He, of course, changed the life of one Molly Ringwald. In her cabaret show, she performs a unique version of the Simple Minds classic from The Breakfast Club, Don’t You Forget About Me. Ringwald’s life has never followed a script. In the 1990s, rather than going down the Hollywood road, she moved to Paris, taking on French acting roles as well as returning to the US to work. She created her own path. Life now is about living in the moment, whether that be writing or acting or singing or getting dinner ready for children. But if she does write her autobiography some day, she’ll have many fond stories to tell. This entry was posted in Adventure, Film, Life, Music, Television, Writing. Bookmark the permalink.